As soon as warmer weather hits, I want to grill everything. I’m pretty sure that 90% of the recipes I’ve pulled out of magazines or bookmarked in the past month have been grilling-related. Besides just feeling summery, it generally means that Mark does more of the cooking and there are fewer dishes to wash – wins all around. This was a great way to serve a loaf of Italian bread. I usually end up making garlic bread or just slicing and buttering – this was a nice, different treat. And with the fresh herbs starting to come out of the garden now, it’s especially perfect! 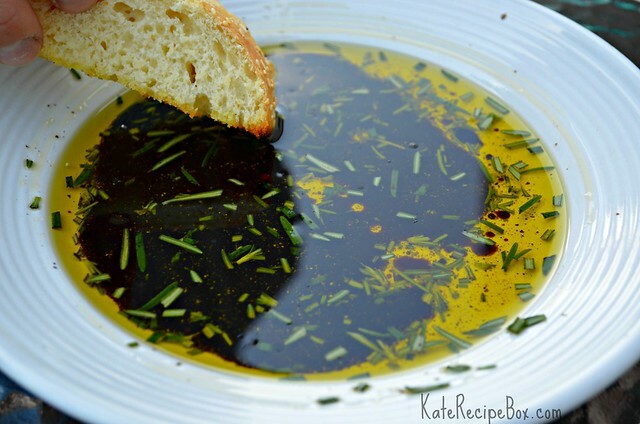 On a deep plate, stir together the olive oil, salt, pepper and rosemary. Add the balsamic vinegar. Serve the bread along with the oil for dipping. I’m so glad you liked my recipe! Yours looks perfect!